When we were offered the chance to review Dream of Venice (photos by Charles Christopher, edited by JoAnn Locktov), we were amenable but skeptical. Photo books about Venice aren't exactly thin on the ground--or on bookstore shelves, for that matter--and most are designed for a quick flip-through, with little text to read. 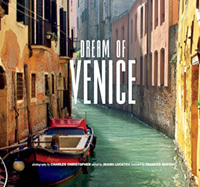 To our surprise, Dream of Venice is different from the usual Venice gift or souvenir book. For one thing, it won't leave bruises on your thighs when you read it: At 9.1 x 8.6 x 0.5 inches (23 x 22 x 1.25 cm) with a shipping weight of 1.2 pounds (0.5 kg), it's more like an iPad than a 1990s-vintage laptop. You can mail it to your Venice-loving best friend, mother, or long-distance paramour without spending more on postage than you did on the book. But there's more to beauty than being svelte, and Dream of Venice is pretty on the inside, too. Each two-page spread consists of two elements: a full-page color photo on the right, and a block of text on the left. The highly readable text is taken from an eclectic collection of sources that range from movie directors (Paul Mazursky, Woody Allen) to authors (Patricia Highsmith, Erica Jong, Jane Turner Rylands) to architects and interior designers (Guido Petropoli, Matthew White), actors (Julie Christie, Claire Bloom) and even a member of Murano's glassmaking dynasty (Giampaolo Seguso, owner of the Seguso Viro and giftmaker to the Pope). The book has a foreword by Frances Mayes. We think Dream of Venice is the perfect gift for Christmas, Hanukkah, Valentine's Day, a birthday, or an anniversary, assuming that the recipient likes Venice as much as you do. Tip: To avoid leaving giveaway fingermarks on the giftee's book, why not order a copy for yourself as a pre-trip, post-trip, or armchair-travel souvenir? For more details, visit the publisher's Web site or see Amazon.com: Dream of Venice, where you'll find worldwide ordering information and reviews by readers. Disclosure: We have no financial interest in Dream of Venice, we aren't personally acquainted with the authors, and we don't receive a commission if you order Dream of Venice from Amazon. We simply like the book.